Srila Rupa Gosvami defines pure devotional service as the tendency to be fully engaged in Krishna consciousness, serving Radha Krishna with love and devotion. Nothing else is present in the mind and heart of a suddha-bhakta than the pastimes of Radha Krishna and the desire to serve during their Vraja-lilas. This devotional service must be free from any desire for material advantages for sense gratification, which increase due to fruitive activities (ie things that are done for a personal result) and philosophical speculation. Krishna consciousness must be learned from authorities. It cannot be learned on its own. When one has a pure heart and free from all identification with matter, he perceives that the Srimurti are not statues but Persons. 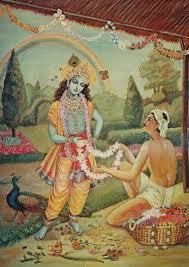 When it reaches this level, the devotee develops a pure love for Them. Up to this level, the attraction for Srimurti is mixed with material emotions (misra-bhakti) and therefore one should not think of having finally become a pure devotee.